The first Raid film took the world by storm just a few years ago. With breakneck action, amazing martial arts, and a tense story, I had deemed it a game-changer, and I was right as everyone else starting trying to race to catch up to the level of badassness that the first film had achieved. Just when folks were getting close, Gareth Evans releases The Raid 2: Berandal on us. So did they raise the bar again? That depends on your disposition. The film begins literally hours after the first film, and we find out the final fate of Rama’s brother Andi, and from there we pick up with Rama (Uwais), wounds still fresh from the Raid, and he finds out that to keep his family safe, he’ll have to go undercover and topple one of the largest crime families in Indonesia. He does so, now under the name of Yuda, in order to get close to Uco, who is in prison. Rama also gets sent to prison, and spends two years there (!) getting close to Uco, but he does, and then once he gets out he finds employment with Uco as an enforcer. Uco’s father, Bangun, is a mob boss who has kept the peace with the local Japanese boss for years, but Uco’s greed seeks to unravel as he aligns himself with Bejo, one of the main bosses and the boss of the baddie from the first film. Things get complicated when a family hit man (Ruhian) and the twins, Hammer Girl (Estelle) and Baseball Bat Boy (Yulisman) enter the picture. Rama must navigate his own morals and find the strength to survive in a dark underworld, and finally has to face a horde of evil in order to get his life back. Whew. When I came out of the film I was shell-shocked. I’ll get to why in a moment. The storyline here is a good compliment to the first film and ties up any loose ends successfully. Things get a bit overlong in the middle, and I think one particular plot line that goes nowhere involving the assassin Prakoso and his family could have been left out and increased the pacing. (Know when to kill your darlings, Gareth). Iko Uwais returns as Rama and manages to look even more flustered and conflicted as ever. Great acting job from Arifin Putra (Goodness, but he looks like Brandon Lee) as the villain Uco. One moment he can act like a spoiled rich brat, and the next he can act like evil incarnate. 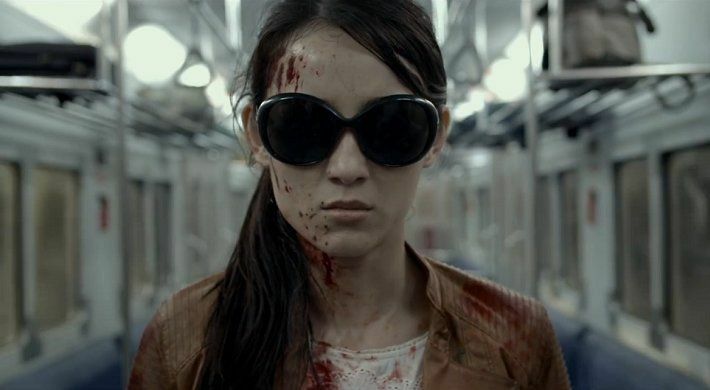 Julie Estelle also does a great job as Hammer Girl, and I suspect we’ll be seeing some Hammer Girl costumes this Halloween. The camera work on the action scenes, particularly the car chase, has to be seen to be believed. Yes, the classic car chase can still be innovated even today, and Director Gareth Evans did just that. The fight scenes by Yayan Ruhian are even more brutal than the first film (if that’s even possible) and in particular the final fight in the kitchen with Cecep Arif Rahman was the closer and was just as great as I expected it to be. That has to be my favorite fight next to the fight Rama versus Hammer Girl/Baseball Bat Boy. The other group fights are great, nothing that hasn’t been seen before, but well shot and choreographed. Now I mentioned your disposition may decide how much you like the film. In this I am not kidding or exaggerating: there is a ton of blood and guts in this one. The blood flows like a river, and many a crushed skull, broken bone and point blank bullets to the face are seen here, I kid you not. Every frame of a fight is layered with a bucket of blood or a cringeworthy move that maims or kills. If you aren’t into the real bloody stuff, this may be too much for you. It’s as if, most will remember those 3 or 4 kills in The Raid that you always talk about with your friends, this film has those moments in nearly ever other frame. I found it a bit overkill and unnecessary and took me out of the film every once and a while. But to each their own. Not the game changer of the original but still a great martial arts film that shows that the team of Gareth Evans, Yayan Ruhian and Iko Uwais are still on top, waiting for everyone else to catch up! Previous Street Fighter: Assassin’s Fist “Ryu Trailer” is out now! Next Ron Smoorenburg is back in Reflex!